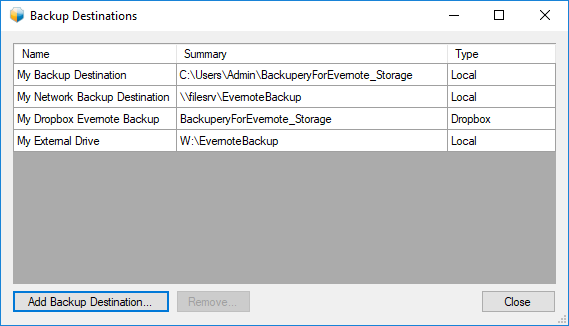 Suppose you want to backup (export) all of your Evernote notes to some safe place regularly to prevent loss of your Evernote data. Backupery for Evernote makes this possible. It is a Windows/MacOS application that performs regular export of all your Evernote notes to a wide range of backup destinations. You could keep your notes in any directory on your laptop or desktop, external hard drive, USB stick, or network share. Also, it is possible to backup directly to Dropbox, or store the notes in any directory that is synchronized with any cloud storage like Google Drive, Microsoft OneDrive, Box, etc. Download Backupery for Evernote to the computer where your Evernote application is installed. Run the installer, and then follow the instructions on your screen. Run the application and follow backup setup wizard. That’s all! Now all your Evernote notes are backed up regularly to the location you can view by clicking on “Backup Destinations” button on Settings tab. Of course, you could add a new backup locations at any time just by clicking “Add Backup Destination”. You could choose any directory on your desktop or laptop, or some folder on your USB stick or hard drive, or use any directory that is synchronized with any cloud storage of your choice (Google Drive, Microsoft OneDrive, Dropbox, etc.). Also, you can backup directly to Dropbox. The application starts when your computer starts, so you don’t need to bother starting the application manually. 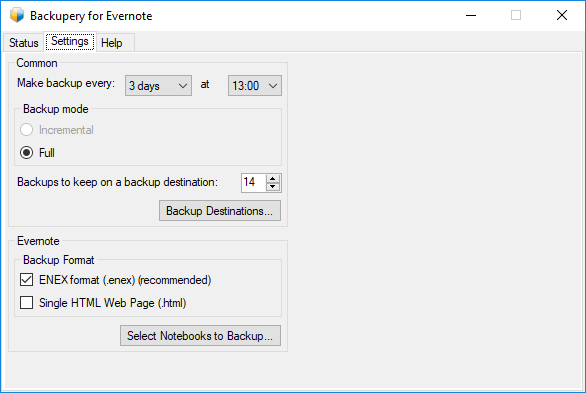 If you are interested in how to restore Evernote notes from the backup snapshots, see the following article: How to Restore Your Evernote Notes Using Backupery for Evernote. As always, if you have any questions – just let us know: Contact Us. To start protecting you Evernote data download Backupery for Evernote now. 2. What happens with incremental backups, are incremental versions created in the backup folder, or are old file replaced? 3. From the screenshots, it looks like the tool only supports a single backup, is this correct? Yes, there is a task on our roadmap to support backup compression. Actually, we’re currently working on a feature that would (hopefully) allow us to reduce the storage space needed to store the backup without losing backup quality. I think the simple example illustrates better what happens in incremental backup mode. Let’s say you incrementally backs up some of your notebook, let’s call it NotebookA. That is the NotebookA directory contains a single file that in its turn contains all the notes from NotebookA. So, generally, if Incremental backup mode is on, the directory contains the single full backup file (usually a large one) and a series of incremental backup files (usually much smaller than the initial full backup file). 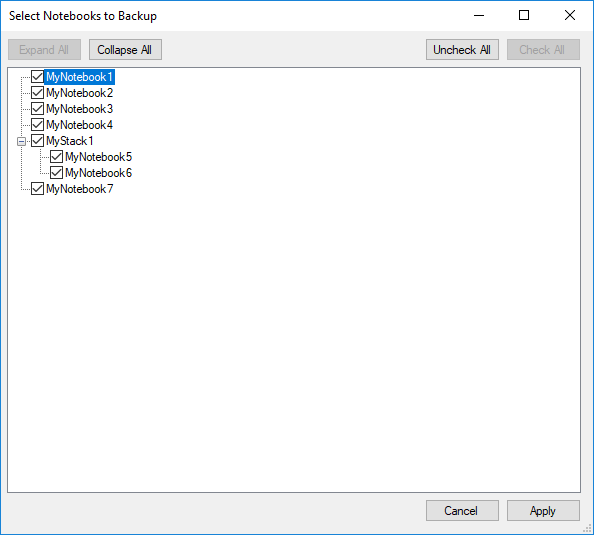 To restore the notebook to some point of time, say April 15, 11.00.00 you’ll need to import the full backup first, and then import incremental backups one by one to the backup taken at the desired date, in our case to 2018_April_15-11_00_00.enex. I’m afraid I don’t get it. Could you please clarify? If we are talking about a count of backups (full or incremental) then there is no limit to backup count, it’s just bound by storage space. If we are talking about a count of accounts to backup, then currently the application supports the single account only, so to backup another account you’ll want to install the second application on another machine. We know it’s not very comfortable, so we’re working on the multi-account backup feature. Hope it will be available soon! In the restore example for the incremental backup does one have to reconcile the multiple import folders oneself? Perhaps relative to 3 above, can one store different stacksnotebooks in different locations? For example if one had synced and local stacks, store each on a different drive? If one wants to restore whole account data (all the notebooks) then it’s necessary to restore each notebook one by one, so import filenameA1.enex first (full NotebookA backup), then filenameA2.enex (incremental NotebookA backup) and finally filenameA3.enex (incremental NotebookA backup). Then do the same with NotebookB and NotebookC. It seems a complicated process especially if one has many notebooks, but from my experience it’s a quite rare task to restore a whole account, that is much less commom than restoring a single notebook or a single note. Unfortunately, currently it’s not possible to split the backup so different notebooks are stored into different backup destinations. The backup can be duplicated to multiplie destinations, so the data is stored on different drives simultaneously. However, the app may support this in the future, so it would be possible to store different stacks/notebooks on different drives (we’re working on similar feature now). Please let me know if you have any questions, I’m here to help!